Under a hail of applause, Leon Gieco took to the stage with another Oscar winner, Gustavo Santaolalla, and performed their classic songs ‘Pensar en Nada’ and ‘Mañanas Campestres’. Other performers included Gustavo Cerati, Los Fabulosos Cadillacs and Pedro Aznar. 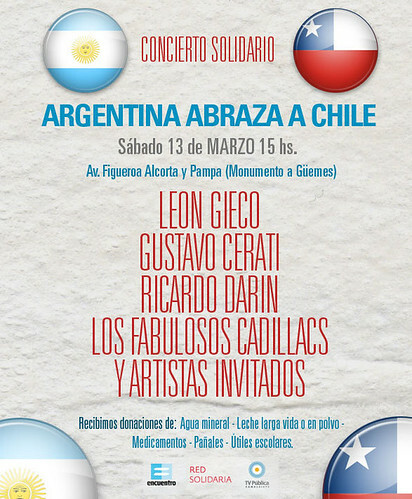 The latter paid tribute to Chile with two songs by the poet and artist Violeta Parra, who helped to revive Chilean folk music with the ‘New Song’ style, and the singer-songwriter Victor Jara, who was murdered by the military following the Chilean coup of 1973. ‘The aim was to tell Chileans that they are not alone and that the Argentineans are with them,’ Carr continued, while emphasizing that ‘Argentineans are very sensitive and understand what happened’. The head of Red Solidaria Argentina, Manuel Lozano, is currently in Chile’s capital Santiago and will travel to the earthquake-damaged Maule region with a first load of donations. ‘Chile is still shaken by the aftershocks and a lot of people are experiencing moments of anxiety. About 500,000 families remain homeless, cold and hungry, and still have to rebuild everything,’ Lozano explained. The donations – over 35 tons of products – were loaded onto three trucks, each weighing 12 tons, and Red Solidaria will continue to receive donations for another 15 days. Two artists have invented a saint to protect residents from gentrification. Yohann Koshy reports. What is digital humanitarianism and what did it do for Ecuador? 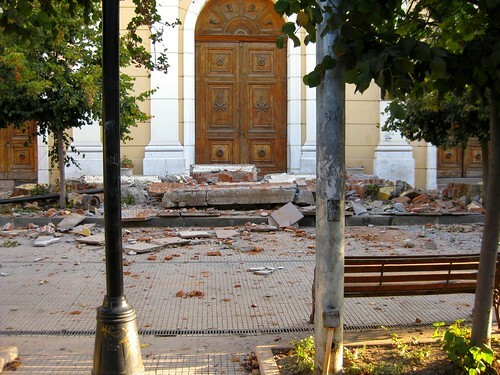 Kimberley Brown looks at how technology could help the South American country’s earthquake victims. Fiona Broom reports from Nepal on the scandal of the ‘orphanage industry’. Women and children are even more vulnerable following the earthquakes, writes Beulah Devaney, so what can we do? The Nepal earthquake has devastated an already-poor nation. What next? asks Mari Marcel Thekaekara. Why is Britain siding with the vulture funds? Will Argentina go into default on Monday? The US supreme court’s decision to back vulture funds could damage all indebted economies. Vanessa Baird reports. David Ransom on plans to dig the biggest hole in the world and what it could mean to local biodiversity. Writing from Argentina, Vanessa Baird finds little enthusiasm for the President’s renewed Malvinas campaign. It’s easy to blame the 2010 earthquake, but there are other factors involved, says Sokari Ekine. Sokari Ekine sees hospitals without hope and women traders being swept from the streets. Mischa Wilmers meets the activists fighting against industrial pollution – and for their health and environment. Mischa Wilmers sees the horror for himself – and meets those trying to change it. A 30-year struggle has finally led to victory for the Grandmothers of the Disappeared. Libby Powell reports. A cartoon introduction to life in the camps in and around Port-au-Prince. Haiti: where did all the money go? Ed Stocker witnessed first hand how the presidenta’s curious combo of glitz, compassion and graft secured a landslide win. Latin America responds to the WikiLeaks revelations. History keeps repeating itself on this beleaguered island. Human rights organizations call for firmer action by the Argentinean government. Wire-tapping scandal leads to mud-slinging between Argentinian politicians. Sokari Ekine considers the politics of humanitarian intervention. The cumulative force of the Diaspora is both formidable and underreported, as Elizabeth Lazar discovers. Argentina launches ambitious plan to give all its students a laptop.